Merak-Sakteng stands out as a distinct attraction in Bhutan. Unlike anywhere else in the country, it offers a visitor to experience a unique semi-nomadic lifestyle, culture and vernacular in one of the most scenic pastoral valleys in the protected area of Sakteng Wildlife Sanctuary (SWS) in Trashigang Dzongkhag (District), in Eastern Bhutan. It is a moderate trek (between 1,500m and 4,100m) traversing through the semi-nomadic villages of Gengu (3400m), Merak (3500m), Sakteng (2800m), Thakthi (2200m), and Joenkhar (1700m). Tour operators are not mandated to use a particular trail but the most common trail usually begins from Chaling and ends in Phongmey. Both these Geogs of Merak and Sakteng are an important watershed for Ngere Ama chu and Gamri chu rivers respectively. The trek lies within the Sakteng Wildlife Sanctuary (SWS). It was created in April 2003 with a strong agenda for conservation and to protect the unique assemblage of biological and cultural diversity in the region. It covers an area of 650 km2 and is bordered by the Indian State of Arunachal Pradesh (Tawang) in the north and east, Phongmey Geog and Kangpara Geog in the west, and Shingkhar Lauri Geog in Samdrup Jongkhar. It is connected to Khaling Wildlife Sanctuary by a biological corridor, a part of the Bhutan Biological Conservation Complex (B2C2). The trek to Merak will start from Chaling reached by following an unsealed road from Rangjung. Damnongchu camping area is located after Mindrula which lies at about 3,316m / 10,880ft. 5 hours, camp altitude 3,499 m. The trail from Damnongchu to Merak goes along the river bank with gradual ups and downs. Over night at Damnongchu Camp. The trek from Merak to Miksa Teng is long and of medium difficulty. 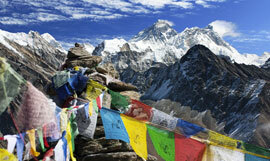 It will pass through the beautiful Nagchungla pass (approx 4,100m / 13,451ft). The campsite is located in a clearing surrounded by rhododendron trees. Trek to Sakteng from Miksa Teng is easy making your way through beautiful woods with a short climb before reaching Sakteng. Overnight at Camp. 6 1/2 hours, camp altitude 1,859 m. Sakteng to Jyonkhar Teng trek is an easy trek comparing to previous days. It is mostly downhill to Phongmey. 5 hours, camp altitude 1,981 m The final day. This day is full with ups and down until you reach the road the head at Phongmey. Drive to Tashigang. Accommodation in 1 room with one extra mattress. Pick up and Drop from Bagdogra Airport.